1. 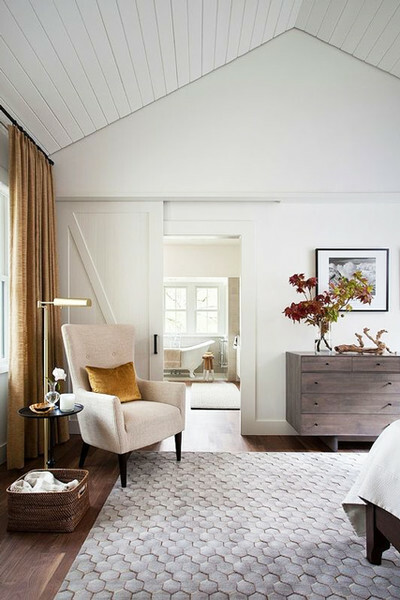 Refined Farmhouse So many people love farmhouse style so be assured that many farmhouse elements aren’t going away any time soon. There will always be an appreciation for well crafted simplicity such as we see with the traditional farmhouse table or a hand-stitched quilt. But farmhouse is becoming more refined and a little more sophisticated. How can you adopt this trend? Keep farmhouse elements to a very few well-loved things. Place a great value on authenticity. Pair a vintage chair with an crisp, modern fabric seat. Opt for clean lines. 2. Soft Curves In the coming months, we’ll see more furniture pieces with curves instead of angular pieces with sharp edges. So many pieces in a room are rectangular and square, from picture frames to chairs to sofas to TVs. A curved piece can soften hard lines and create intimacy and a feminine softness. 4. Matte black fixtures Unlacquered brass is still hot, hot, hot, but matte black is being seen all over, too. And you can definitely mix the two. In fact, mixing finishes adds a layered interest to any space. 5. Bold florals: Feminine florals back in a big way BUT NOT in an 1980’s way. This year’s florals are jewel toned, graphic and bossy. Pair them with subtle textures and smaller prints to really make a statement! 6. Colored Cabinetry While white kitchens will always be classic, we’re seeing more and more colored cabinets in shades like this deep green. Or this stunning cobalt blue. What do you think about these new trends? Which one are you most excited about? I haven’t written an art post in a while but I’ve been saving and pinning all sorts of original art and vintage prints and other wall decor that I love. I’m always on the lookout for unique artwork because I think dressing your walls can sometimes be difficult. But when you get it right, beautiful art can really make the space and help tell a story in a room. I LOVE fall and autumn “motifs” but really I’m always drawn to natural elements in art, fabrics and accessories no matter what time of year it is. Becca Stadtlander is an artist I just discovered on Etsy and I love her work. She offers prints of her original paintings printed on watercolor paper. I couldn’t decide on just one so I included two of my favorites here. I love the colors in these original watercolors plus I have a weird things for mushrooms. Olena creates custom home paintings, too! I’m always picking up vintage art in consignment shops and antique stores. This one is a mid-century original piece by a Ukrainian artist. Here we go with mushrooms again…A reproduction of a French educational chart. I’d hang this is my kitchen in a simple wooden frame. I’ve loved this shop forever. StudioLicious creates “paint-by number” style art on wooden blocks that can stand on their own or hang on the wall. Here in the south, autumn is the time for harvesting cotton. Where I live, it’s growing all over, acres and acres of white fluff. It almost looks like snow! This piece is sent as a printable file in two different sizes. I like the simple, graphic of this one. I love Amber Alexander’s work. She paints the sweetest watercolors of animals and has holiday cards in her shop, too! I saved one of my favorites for last! I love, love these prints made from original herbarium pressed botanicals. So beautiful. Need help selecting and framing your art? Not sure where to hang it? 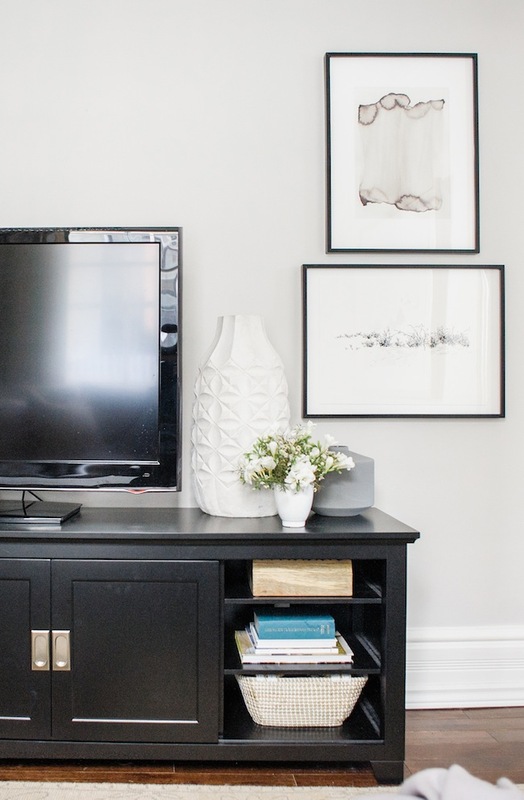 Like the look of gallery walls but don’t know where to start? Let’s chat! 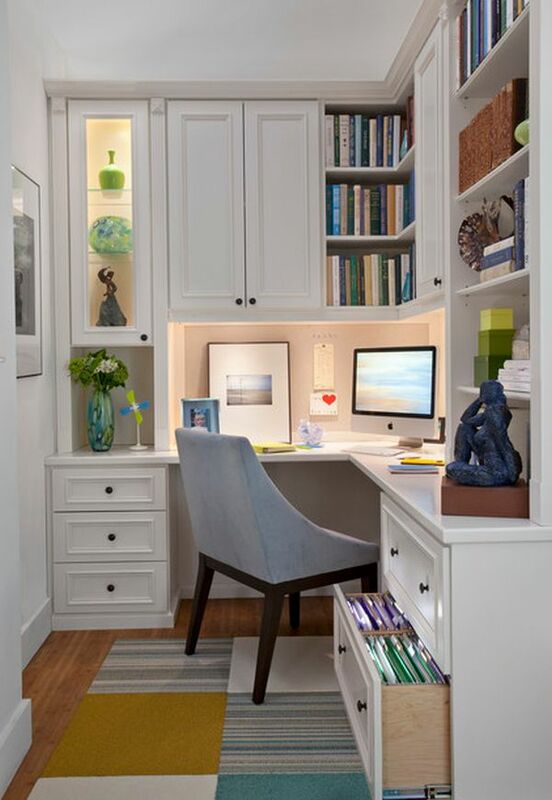 Last week I talked about home offices and how to personalize them to increase your creativity, focus and productivity. Well, today I have a design board for a pretty little office that incorporates much of what I spoke about last Monday. I selected options from a variety of places to create a collected look but I kept the storage white to keep the overall feel clean and uncluttered. The desk is a vintage piece from Chairish and I love how the wood tones help to warm up the room. The Ballard rug in warm, neutral tones adds coziness without looking too busy. The Etsy artwork is a favorite from Pratt Creek Art. Modern with an organic feel and lots of movement, it brings some energy to the room and help bring the outdoors in. I added a vintage umbrella stand to bring in an unexpected element. It makes pretty vertical storage for architectural drawings, maps or wrapping paper. I added a the gorgeous brass chandelier and waste basket just because! If your office is a beautiful as the rest of your home, it’ll be a place that you enjoy spending time in. I used a smallish table lamp for the same reason. There are loads of pretty desk lamps these days, but I think this gorgeous ginger jar lamp has a little more feminine charm than the more industrial task lamps, don’t you? Want to revamp your office space? Let’s talk! I’ve written before about turning a dining room into an office to make efficient and practical use of a space that may not be used much formally. But today I’m talking offices that are just offices and beautiful ones at that! If you are a visual or creative person, it can be difficult to work in a space that isn’t stimulating in some way. If you have a window (I pray and hope that you do!) you can simply look out to help give you a burst of energy. Color on the walls can help stimulate creative thinking as well. I like using landscapes in a work space because it help brings the idea of organic and living elements into a room–especially if you don’t have a window or if your view is less than appealing. Here’s some yummy offices and tips for making the most of your own creative space. Pick a paint color that appeals just to you. 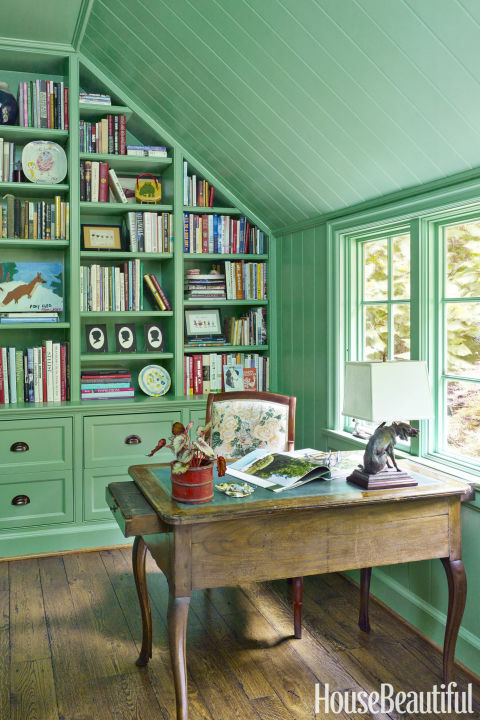 This minty green (Farrow and Ball’s Arsenic) ain’t for everyone, but it’s right at home in this Alabama cottage and pairs perfectly with the vintage desk. 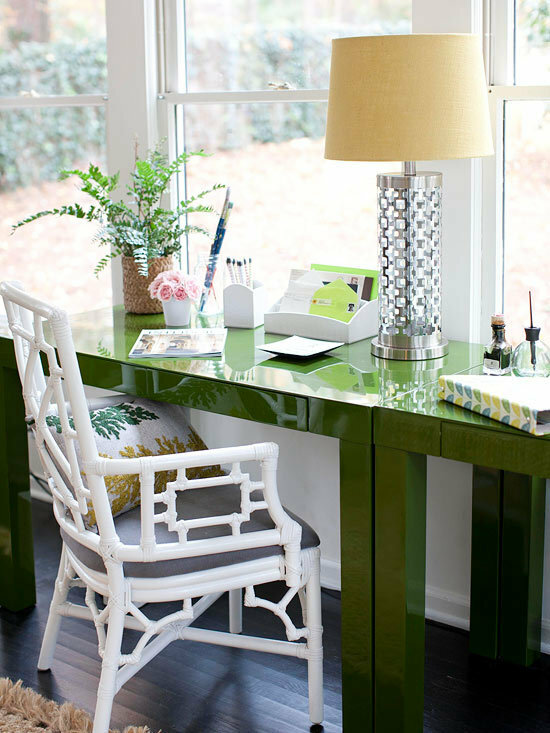 Turn your desk toward the outdoors! The olive lacquer on this desk serves to blur the line between the outdoor and in. Create a library in your office. These floor-to-ceiling shelves packed with books help up the coziness factor and keep the office from feeling cold and stale. Swap out a desk for a table. In a small space, a table can really open up the room because your eye can move around and under it. This works here because the built-ins offer storage. Add warmth to an office with a rustic wood table. Top it with glass to create a smooth surface for writing. I’ll leave with with this insane office. 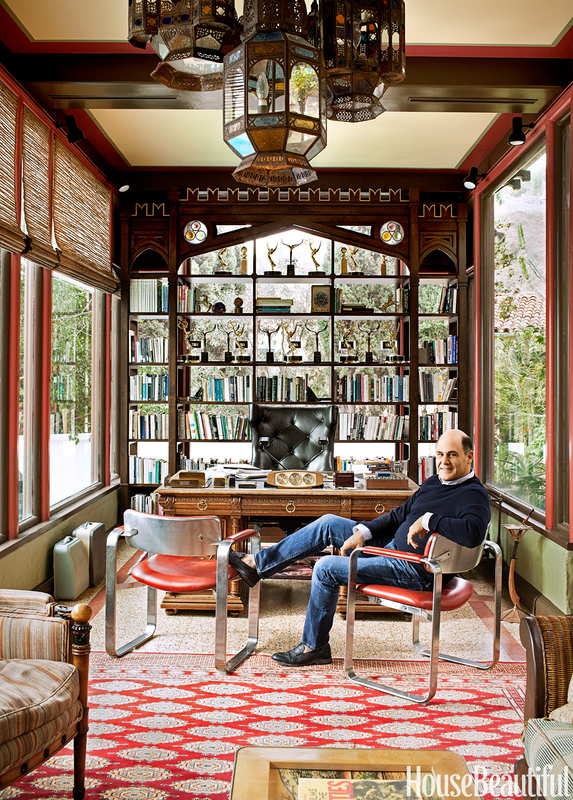 It belongs to Matthew Weiner and was featured in House Beautiful during the last season of Mad Men. Does anyone else miss Don Draper? All the heart eyes #amIright? Today I’m featuring my latest (and dare I say my favorite?) design crush, Sarah Bartholomew! I can’t remember exactly when I discovered, her work, but it’s amazing and I think I’ve pinned nearly her entire portfolio. I think you’ll agree that her mix of vintage and antique pieces with natural elements and newer pieces creates the most beautiful, livable spaces. 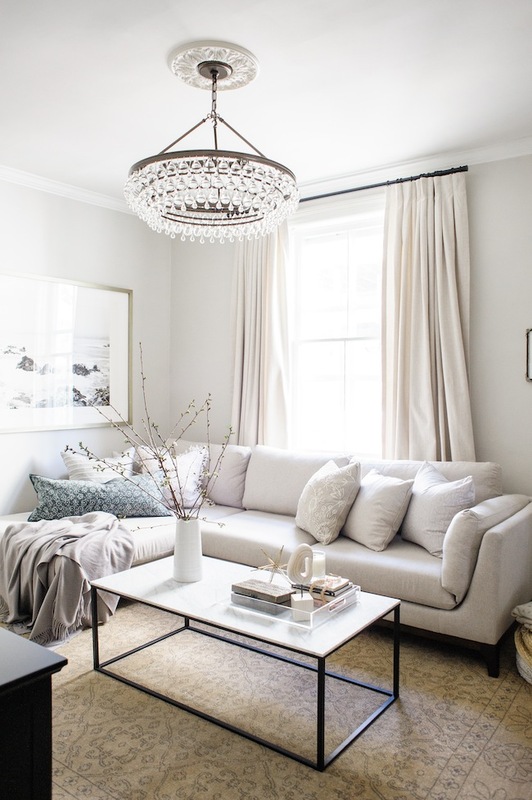 These photos are from Sarah’s family room in her own home recently featured in Southern Living. I love her mix of pattern and texture. It creates such a casual elegance, doesn’t it? And I always love birds. A bird gallery wall? Now that’s perfection. The simple black frames really pop against the gorgeous millwork. She’s a master at layering pieces to created that “collected over time” look. More birds in a 1901 Georgian rowhouse featured in House Beautiful. Again, I love the easy elegance she creates with the leaning artwork. 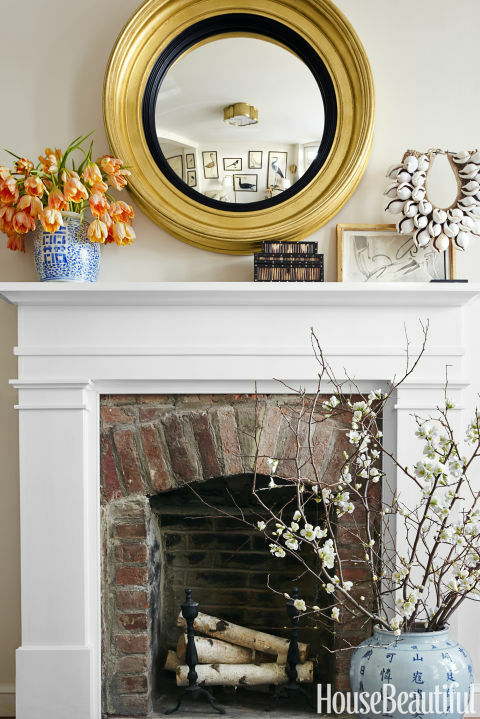 The bull-eye mirror over the brick fireplace creates the perfect mix understated glamour. Never has a small eat-in kitchen looked so inviting! Want more Sarah Bartholomew? Check out her monthly newsletter, Sarah’s Studio as well as a fun interview with designer Paloma Contreras, here. A lovely home or a family pet? Although it may often seem this way, you truly don’t have to choose between a stylish, beautiful home and a furry friend. Even if your pet sheds, there are many practical steps you can take to keep your home and your pets happy. Really! When we first adopted our little Jack Russell pup, I thought I’d have to kiss a stylish home goodbye forever. He sheds big time and it was a while before he was totally trained. But my house survived and with a few changes we’ve all learned to live together. And good thing, too, because he’s really my favorite child. At least when school’s out for the summer! Below are nine tips that will help your home and your pets live in harmony. 1. If you need to restrict your pet to certain areas, select a gate that isn’t hideous. I bought an ugly, plastic baby gate to contain our pup before I realized there were much better options! 2. Have pillows and slipcovers made in synthetic performance fabrics. There are some gorgeous, resilient fabrics on the market today. Try Crypton, Perennials and Sunbrella. 3. Pick forgiving prints over solids. Prints hide dirt and fur so much better than a solid color. 4. Choose tightly woven fabrics. Pet claws and nails can get caught and snag looser woven fabrics like tweeds. 6. Choose indoor-outdoor rugs like this beautiful kilim! 8. Opt for washable slipcovers over upholstery. 9. No pets on the furniture! Just kidding–who ever sticks with that rule? Instead keep a washable throw blanket on the areas of the sofa your dog or cat likes the best. 10. Buy a stylish pet bed with a removable cover.